I have huge respect for Salman Khan. He's turned his fortunes around and almost all his films (Wanted, Dabangg Bodyguard, Ek Tha Tiger, Ready and the like) have had massive returns at the box office. But after taking a look at the trailer of his next, Jai Ho (earlier titled Mental), I'm having my doubts as to how long he will sustain on the back of such ridiculous films. Granted this is just a teaser trailer of the film, but one look at it, and rest assured you can bet you're in for a headache. It has elements of the Hollywood dud Pay It Forward, mixed with the usual 'one man against the corrupt system' scenario, and irrelevant supporting characters thrown in for effect. But you can bet your buck that the entire film will be a Salman Khan stardom showcase. He'll beat up a thousand goons, get the girl and make the cliched heroic speeches, and no doubt the public will come to theatres in droves. Salman Khan earlier today said earning Rs.200-300 crore at the box office was not an ego game, and that he hopes each film can do good business. "We only hope the person who has put in his money should be able to recover it. They should not lose their money and we don't lose our respect. Rs.200 crore or Rs.300 crore is not an ego game," Salman told reporters during the trailer launch of his anticipated film Jai Ho. "If an Aamir or a Salman film is doing well, then it's a good thing. Every film should do well and the industry should make money," he said. The actor, who is a very private person, remained mum when asked about his marriage plans. "I took birth in a family which was a part of this industry. By luck, I got this platform thanks to Sooraj Barjatya who gave me a break, and luckily the film also worked. I have no contribution in it," said Salman to reporters. "I had no intentions to be a star. I like to travel by rickshaw, cycle. I am enjoying my success and when I don't have it, then also I will enjoy," he said. The actor who has lost his temper several times said fans should not cross their limits. "Fans tend to cross their line at times. They get into personal lives. At times, fans get carried away," he finished off. Jai Ho is directed by Sohail Khan and also stars Tabu, Danny and Daisy Shah and hits theatres Eid 2014 — expect more records to be broken no doubt! 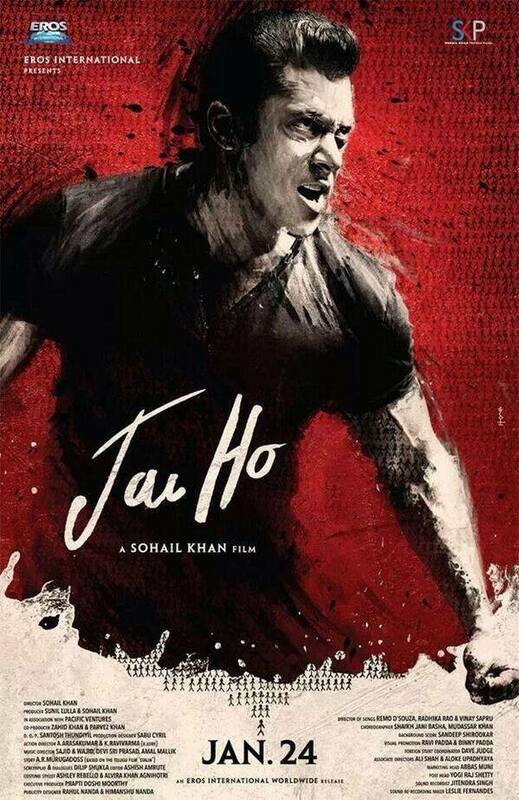 What do you think about the first look of Jai Ho?